Annet van Hooft is an independent arbitrator and counsel based in Paris. After having practiced for more than 20 years at major U.S. and U.K. law firms in Brussels, New York and Paris, and having been a Counsel at the ICC Court of Arbitration, she decided to set up her own law firm, focusing on international arbitration. By operating in a small structure, Annet is able to avoid the conflicts of interests that are so prevalent in large firms. It also allows greater flexibility in terms of staffing of matters, which can be arranged on a case-by-case basis, based on Annet’s extensive network. Last but not least, it allows Annet to personally spend more time on matters, resulting in better client service. Annet is admitted to practice in both common and civil law jurisdictions and has a broad range of experience, both as counsel and as arbitrator, handling international arbitrations under various applicable laws and in a wide variety of sectors and fields, including construction & energy, IP related disputes (e.g., pharmaceuticals, life sciences, technology and communication) and corporate law related disputes (e.g., joint-ventures, mergers & acquisitions). Annet has been recognized in ‘Best Lawyers in France’ for Arbitration and Mediation and in ‘Who’s Who Legal France for Arbitration’. She has also been included in ‘Who’s Who Legal Arbitration Future Leaders 2018’ in the category ‘Partners’, and was listed among the 10 most highly regarded partners in Europe. She is the winner of the ‘Best in Commercial Arbitration Award’ of the Euromoney Women in Business Law Awards (Europe). 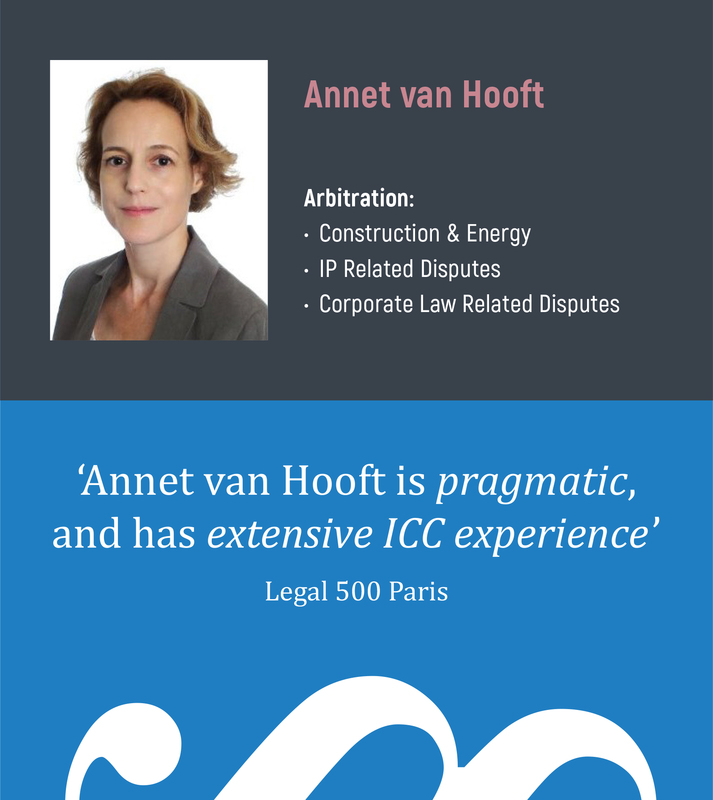 Legal 500 Paris mentions Annet’s ‘extensive ICC experience’. Annet is a former a former Vice-Chair of the ICC Commission on Arbitration and ADR, a co-chair of the Paris Bar Open Commission on International Arbitration and a Honorary President of the Bucharest International Arbitration Court (BIAC). She is the co-author of ‘Arbitrating under the 2012 ICC Rules: An Introductory User’s Guide’ (published by Kluwer Law International).